Home Dinosaur How do we know what we know about dinosaur behaviour? Much of my research looks at reconstructing the behaviour of non-avian dinosaurs: animals that have been extinct for some 66 million years and are represented only by fossils. This statement alone is often enough for people to either ask how on Earth this is possible, or to state quite baldly that it must all be made up. As with many branches of science, certainly there have been (and occasionally still are) some pretty terrible ideas and hypotheses that have been advocated at various times for dinosaur behaviour, but there is a myriad of sources of information and techniques that can be brought to bear on the problem. 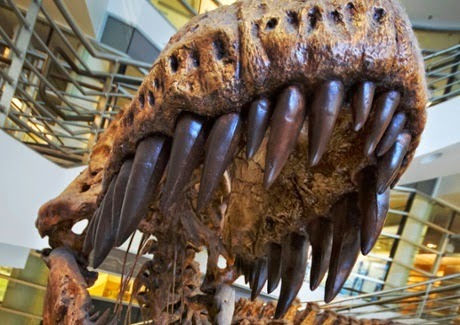 The majority of dinosaur remains are of course bones and teeth, but these have a lot to say. Aside from very obvious things like the teeth of carnivores tending towards being sharp, some major anatomical adaptations are strongly linked with certain behaviours. For example, animals that can run quickly and especially those that are efficient over long distances have a short thigh, but long foot, so we can make some reasonable deductions about how they moved from this. Others are still more extreme and clear cut – those animals that dig show a whole suite of adaptations to the claws, fingers, wrist, elbow, shoulder and pelvis and often too the ribs, and joints in the backbone. So when we see all of these features in the tiny alvarezsaurid dinosaurs, we can be very confident that they could dig. We can even test these kinds of mechanical ideas with computer simulations. The skull of Tyrannosaurus for example has been shown to be exceptionally good at resisting the forces delivered in biting (more so than other carnivores) and this matches the extra-strong teeth they have, the increased areas for muscle attachment to deliver that bite, and even punctures made in the bones of other dinosaurs when tyrannosaurs bit them. Bringing together multiple lines of evidence like this can therefore build an exceptionally strong and coherent picture of certain behaviours. Bite marks on bones can provide more detail than just how hard animals were biting, but also whole patterns of feeding. Are the teeth driven into the bone, or do they slide across the surface? Actually tyrannosaurs seem to have done both, biting hard on joints, but scraping teeth across the surface to rip meat off a relatively fresh carcass. Often it is hard to match marks from teeth to individual species, but it is possible in some cases. Better still are stomach contents. Sometimes dinosaur specimens do preserve with the remains of their meals inside (and the reverse is true, dinosaurs were eaten by other animals too). This is more common for carnivores where bones can survive well and from this we know that many carnivorous dinosaurs seem to have preferentially fed on small or juvenile dinosaurs. Others ate a wide variety of other animals, and the tiny gliding Microraptor seems to have been a generalist with various specimens having consumed a fish, a bird, and the foot of an early mammal. Herbivorous dinosaurs are known to have consumed various leaves, ferns and even pine cones. Continuing down the gut, we also occasionally get coprolites – fossil feces – and naturally this can give a pretty clear idea of what the animals were eating. Moving on from feeding, we can also reasonably infer that dinosaurs were reproducing, after all, they were around for quite a while and birds (and bees, and even educated fleas) are still doing it. More than that though, we see eggs laid in patterns in nests, as do some modern birds. We also see dinosaurs preserved brooding on those nests, protecting the eggs and perhaps sheltering and insulating them with feathers too. The dinosaur Oviraptor (the “egg thief”) was so named because it was found in association with eggs thought to belong to another dinosaur, but later discoveries of embryos within these eggs, showed in fact that the parents were protecting their unborn offspring. 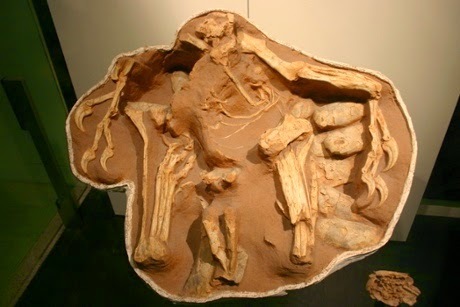 In other dinosaur nests we see babies considerably older than newly hatched individuals and even traces of food. This implies that the adults were looking after these babies long after they hatched, and that some extended parental care may have been involved. This is something we would predict from their living relatives. Modern birds are literally living dinosaurs, and the crocodilians are their next nearest evolutionary relatives that are still alive today. Both exhibit parental care in nearly all species, looking after both the eggs and the hatchlings, in some cases for a number of years. That this is near universal behaviour for both, and when there is at least some evidence for this in dinosaurs, does imply that it was an ancestral trait for the collective group and thus most dinosaurs likely gave some care to their offspring pre- and post-hatching. Other patterns of behaviour can also be detected from where fossils are found. For example, specimens of ankylosaurs (those wonderfully squat and armoured dinosaurs) are regularly found in marine deposits, even well out to sea. They were terrestrial animals, but perhaps spent a lot of their time close to the coast or around estuaries and rivers, meaning that they are washed into the sea more often than many others. On the flip side, the pachycephalosaurs and their giant bony heads seem to have favoured upland environments. Fossils of these animals are very rare and most of their remains are only the “skullcaps” of solid bone, but these are rather beaten up. This is exactly the pattern we see when bodies have been transported a long way by rivers with skeletons being broken up, small bones destroyed and only the most robust parts (here, the top of the skull) surviving and the clear conclusion therefore is that they lived in upland areas. Put all of these lines of evidence together – eggs, nests, anatomical specialisations, coprolites, mechanical tests, bite marks, stomach contents, preservation types – and we can really start to get to grips with these issues. Add into this other studies – such as from footprints and trackways, reconstructing muscle groups, analysis of seasonal temperatures and climatic changes, scans of brains and bones around the ear to give ideas on senses, stress fractures in bones showing where peak forces were delivered, systematic injuries suggesting combat between horned dinosaurs – and you can see how a clear picture can be put together of the otherwise intangible behaviour of long extinct animals. There are of course limitations here, and plenty is uncertain or unknown, but this is neither impossible to work out nor a work of fiction, but solid researched based on a wealth of data and careful analysis.